KEY CONCEPT: The history of money. 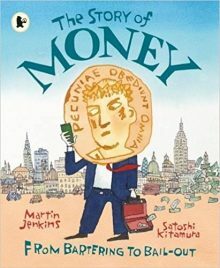 DESCRIPTION FROM THE PUBLISHER: A funny, philosophical look at the universal subject of money by award-winning non-fiction writer Martin Jenkins, illustrated by Satoshi Kitamura. In the Yap Islands in the South Pacific money can be a stone with a hole in the middle. It can be a string of shells, a bundle of cloth or a copper slab. It’s the stuff that makes the world go round and doesn’t grow on trees. In this fascinating and thought-provoking book, Martin Jenkins explores the history of money from its earliest beginnings to the electronic banking of today. Along the way we learn about hunter gatherers, barter, clay tablets, goat swapping, precious metals, hard bargains, IOUs, interest, coins, Romans, taxes, inflation, paper money, currencies and exchange rates. Satoshi Kitamura’s quirky, satirical drawings perfectly complement the dry humour of the text and in the end we are reminded that money only exists because we believe in it.